What does this look like to you? I call it a win-win-win situation! 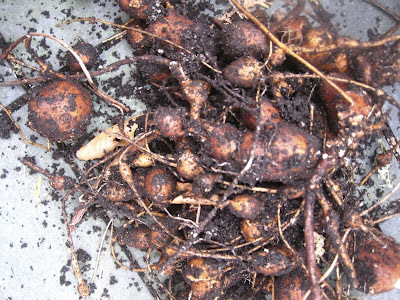 For those of you who are wondering why I'm so excited about a pile of dirty tubers, I refer you to an earlier post in which I waxed rhapsodic about Apios americana (aka hopniss). I promised I'd write about the harvest when the time was right, and that time is now. 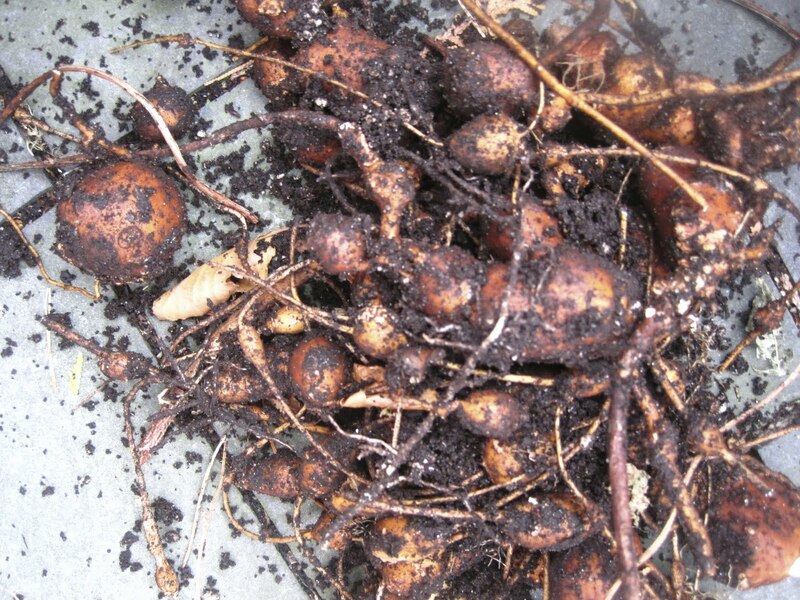 So why is harvesting the tubers a win-win-win situation? 2) I win because I get to eat them. 3) You win, because I've got extras and I want to give them away! The vines grew like crazy this summer, so I wasn't surprised to find the container (48" x 12" x 18") chock full of tubers when I did my clean up last week. Hopniss tubers grow in underground chains, radiating out from the bottom of the plant. Harvesting approximately 30% of the tubers in fall leaves plenty to support next year's plant growth and at the same time provides you with some excellent and unusual eating. Apios americana is a favorite wild edible among foragers, but it's only recently crossed over into the ornamental market. In the wild it can be hard to dig, since it often favors rocky soils and river banks. In a cultivated garden, Apios fairly explodes with gratitude, climbing 20-30 feet in a single season and producing a bumper crop of deliciousness. 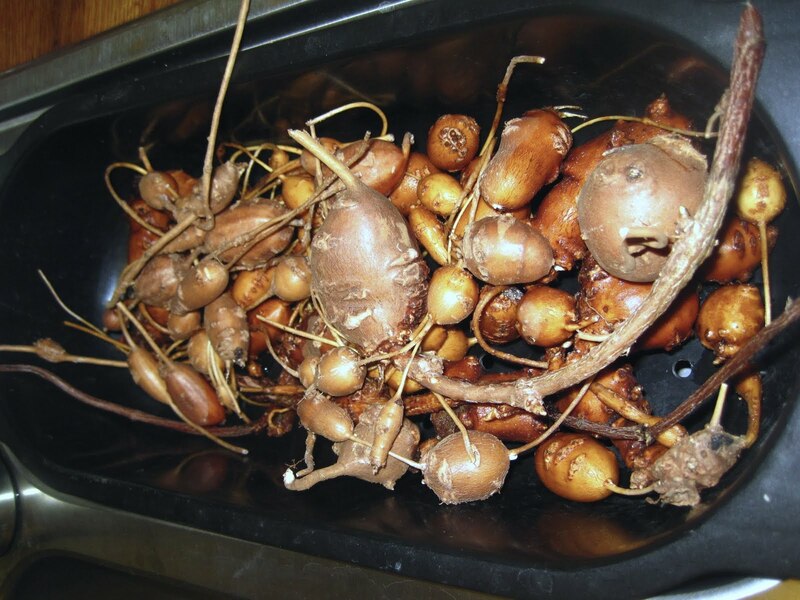 The tubers look a little more appetizing after a good bath, don't you think? I'll peel the larger ones, but most of the year-old hopniss can be eaten with the skins on. This year they're destined for goose fat, S&P and that's it. The taste of hopniss is so superb, like a nutty potato, I don't mask it with sauces or heavy spicing. Goose fat compliments their fluffy texture wonderfully. But enough about me...what about you? Well, some of the tubers I harvested are too small to eat, but plenty big enough to plant. Bury each tuber three times as deep as it is tall and you're in business. (If you can keep the squirrels away, that is.) If anyone's interested, please let me know and I'll make arrangements to get you a few. First come, first serve. And don't worry, you don't HAVE to eat them. Feel free to just revel in their heady scent come next August. Wow, I've never heard of these tubers before. They sound very interesting. What do they taste like? Hi Meems, they taste sort of like a nutty potato. I always think it's hard to describe one food in terms of another, but believe me, once you taste them, you can't stop thinking about them. Zoe, I'd love to send you some, and I have plenty. They grow best in full to part sun, and they really are a fantastic plant. I found my first specimens by Shohola Lake (Pike County, PA), so I wouldn't be surprised if you have them around Scranton. Email me your address, and I'll put a few tubers in the mail. Shady, 6 hours should be fine. You may get fewer flowers, but plenty of tubers! The vines I grow in NYC only get about 6 hours, and they flowered well this summer. Send me your email (click on my photo for my email address) so we can arrange shipping. Yum, so interesting. Now I can pass this along and people will think I am an Alice Waters in the making! sure, i'll take some of these beauties if you have any left. You can bring to NYBG & I can meet you on the 14th. Or in town - or you can mail them! Thanks so much for all your interest. I have enough to send a few tubers to everyone who has asked, but that's it. So no more requests, please. Sorry! If you haven't already emailed me your snail mail address, please do so by Thursday. I'll be taking the tubers to the P.O. on Friday. Thanks Ellen, for a good article. 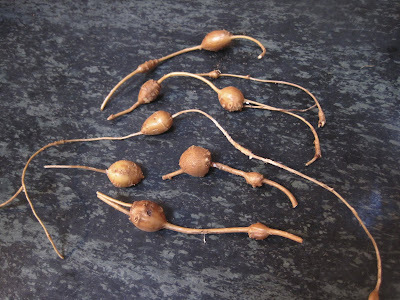 I looked into growing strange tubers a few years ago and ran across things like Chinese Artichoke, Oca, and a few other tropical starchy types but never heard of Hopniss. It sounds interesting. I read about this plant in Samuel Thayer's book and I'd like to try growing it here in Oregon...which is WAY outside of its range.